Built in the early 16th century, the cloister of the Abbey of Saint Maria in Porto gets its name from the Loggia del Giardino, better known as the Loggetta Lombardesca, from the Campionese and Lombard workers, operating there under the direction of Tullio Lombardo. The original building underwent changes in its use and function from the period of the Napoleonic suppressions, up until its renovation in the early 1970s. The only things remaining of the original building are the cloister, with original renaissance proportions, the layout of spaces and the elegant loggia with five arches, which has become the monumental emergence and symbol of the entire complex. 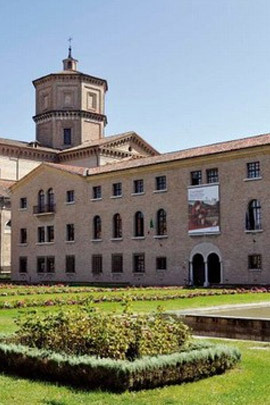 Currently, the Loggetta Lombardesca is home to the Art Museum of the city of Ravenna, since 2002 the Institution of the Municipality of Ravenna. With the creation of the Institution, the museum (which was already the Municipal Art Gallery) has relaunched its cultural activities. It has combined the already-consolidated activity of preservation and promotion of the patrimony with a well-structured cultural production, by creating the International Mosaic Documentation Centre, and also an exhibition activity, allowing the results of the most advanced scientific research to be divulged. The museum moves in various directions, in order to investigate art workshops, from the wide topics of contemporaneity in a historical perspective, to the frontiers of emerging creativity and from work to promote the patrimony to the recovery of material culture and manufactured articles.